I'll be the first to admit that I'm not the biggest self tanner but I like to bronze up a little during this time of year (#barelegsweather). I remeber seeing Skinny Tan on Dragons Den earlier this year and I really liked the sound of the product. 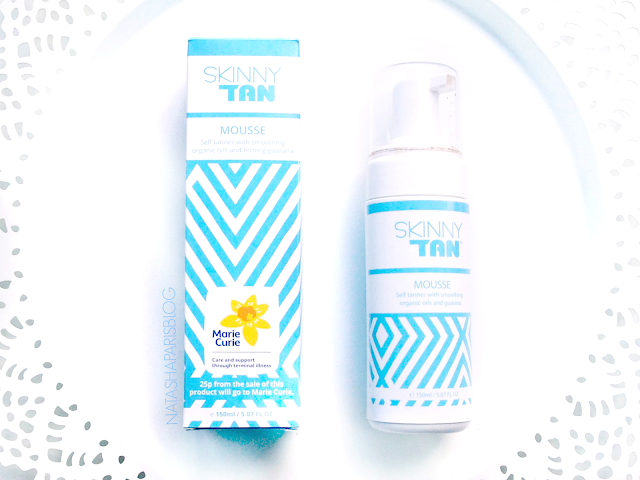 Since being featured on Dragons Den Skinny Tan is now available in the UK exclusively at Superdrug. There was an offer on Superdrug online around a month ago and I decided that this was the perfect time to treat myself to a bottle of Skinny Tan Mousse. I've tried out this tan a good few times now and I've found that by applying once weekly I am able to get around a weeks worth of wear before the tan starts to fade and I need to reapply. The tan can also be layered and I believe this would provide a longer lasting result - this isn't something I've tried just yet but is definitely something I'd like to try to see how it compares. This product is really easy to apply and doesn't take long to develop into a lovely natural looking shade. However, I've found that I achieve the best results when I leave the tan on overnight and shower off the next morning. On a slight negative note I have found that this tan can tend to cling to any dry patches of skin, however I've tried to reduce this by exfoliating and moisturising prior to tanning and I've found this to reduce the problem. Fancy giving Skinny Tan Mousse a go? You can purchase this product here. Have you tried this product? Or do you plan on doing so? I'd love to know what you thought - let me know in the comments below.